A little over a year ago, NRDC helped Montana Wildlife Services organize a first-of-its-kind workshop on nonlethal ways to protect livestock from predators. 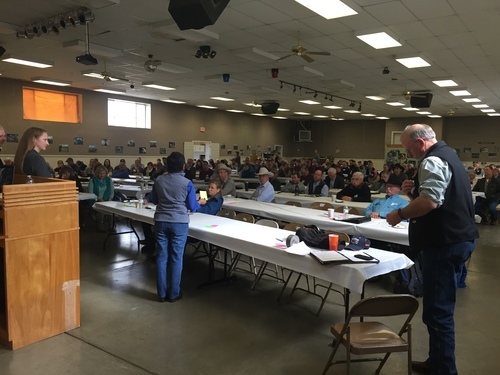 That event, held in Dillon, Montana, was a huge success and prompted Wildlife Services, for the first time, to hold additional workshops in Montana, California, Minnesota, Oklahoma, Wisconsin, Idaho, and Texas, with more planned for Montana, Oregon, Washington, Utah, Nevada, Arizona, New Mexico, and North Dakota. The agency's increased commitment to educating ranchers and the public about nonlethal prevention measures over the past year has been a remarkable and unprecedented development, and one greatly appreciated by the conservation and livestock production communities alike. At a recent workshop held by California Wildlife Services (with State Director Dennis Orthmeyer at right). Photo credit: NRDC Senior Attorney Damon Nagami. However, as I urged in my last blog, now is the time for the agency to take the next step and help ranchers actually acquire, install, and use these measures. Historically, Wildlife Services has viewed nonlethal prevention as the responsibility of livestock producers, rather than the agency's. But there is no good reason for that position. Instead, Wildlife Services should see itself as perfectly situated to take the lead not only in educating people about these practices, but in helping to employ them on the ground. Encouragingly, after lengthy discussions, Montana Wildlife Services has decided to work with NRDC to do just that. We want to show that these measures don't just sound compelling in conference rooms or look good on Power Point slides. We want to demonstrate--as many scientists, ranchers, and conservationists have before us--that they actually work in the real world, where there's snow and mud and wind and wolves and grizzlies and hour-old calves and real concerns--for cattle and carnivores alike. 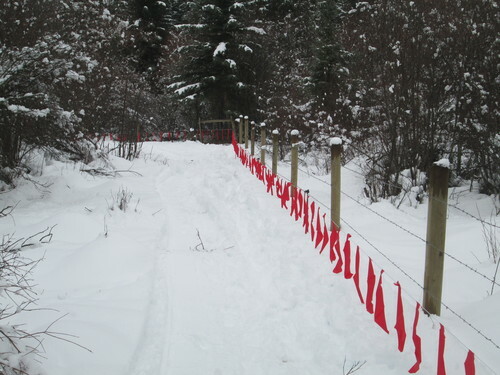 So, this winter--as mentioned in a recent story by High Country News--we began a unique collaboration to install electrified fladry (polywire draped with nylon strips that flap in the breeze and that has been shown to effectively deter wolves) around calving pastures on ranches where producers have been impacted by wolves in the past. We purchased several miles of the specialized fencing--a first for both organizations--and have since worked together to set up and maintain it. Our goal is simple: reduce the use of lethal control, and keep more livestock and wildlife alive, by working proactively to prevent conflicts from happening in the first place. Of course, this effort is a small step. It's one project in one state focused on a single tool. And, needless to say, NRDC and Wildlife Services will continue to strongly disagree on many issues--including the agency's use of traps, snares, poisons, and pre-emptive aerial shooting to kill many thousands of coyotes, bobcats, mountain lions, wolves, bears, and other predators every year. But this is nonetheless a positive step and a groundbreaking collaboration focused on the enormous amount of common ground that NRDC, Wildlife Services, ranchers, conservationists, other agencies, and the public should all share: preventing depredations and the unnecessary deaths of livestock and predators. And while we might not agree on everything, and though the project has a long way to go, we've already shown that a handful of people with very different backgrounds and perspectives can work side by side pounding posts and hanging fence (and laughing over personal experiences with electricity)--and shake hands at the end of the day over a job well done. Many thanks to the livestock producers who have welcomed and worked with us thus far. Their advice and hospitality have been extremely helpful and rewarding. My hope is that this project can serve as a model for future, similar collaborations between Wildlife Services and other conservation groups, ranching communities, and agencies across the region and the country. In the meantime, if you're a livestock producer in Montana who would like more information about being involved in this project next year (or just want to share a good story about getting zapped by an electric fence), please feel free to contact Montana Wildlife Services Director John Steuber (John.E.Steuber@aphis.usda.gov) or me (zstrong@nrdc.org). 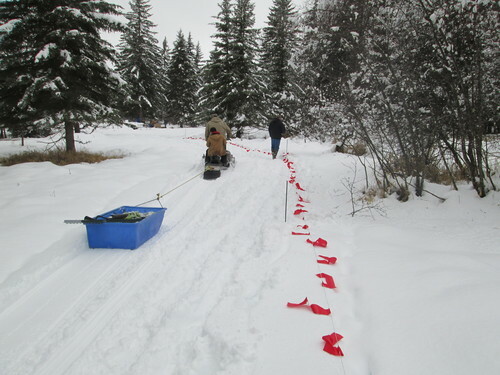 Step one: using sleds and snow machines to lay out the fence and shuttle equipment. Photo credit: NRDC. Step two: hanging the fladry tight, just a few inches off the ground and a few feet away from the permanent barbed wire fence. Photo credit: NRDC. 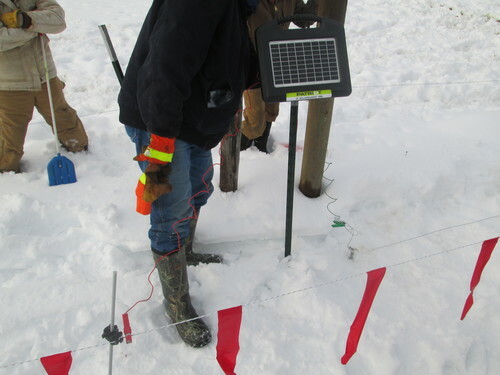 Step three: using a solar charger to electrify the fence. Photo credit: NRDC. 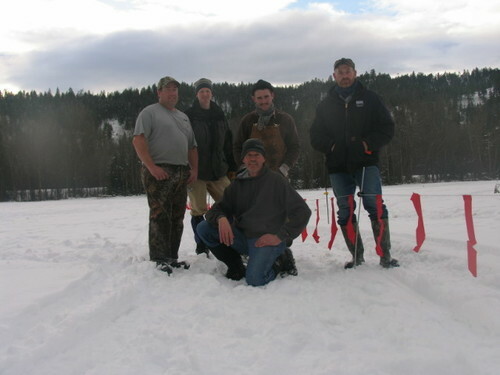 The crew (from left to right): Wildlife Services Specialist Ted North, NRDC Wildlife Advocate Zack Strong, Wildlife Services State Director John Steuber, University of Montana student volunteer Charlie Lytle, and Wildlife Services Western District Supervisor Kraig Glazier. (Not pictured: NRDC Winter Wildlife and Energy Intern Oliver James, and several local residents whose help that day was greatly appreciated.) Photo credit: John Steuber, Wildlife Services.